Schlock-Wire: More Italian Horror From Scream Factory With METAMORPHOSIS And BEYOND DARKNESS On One Blu-Ray In August – Schlockmania! 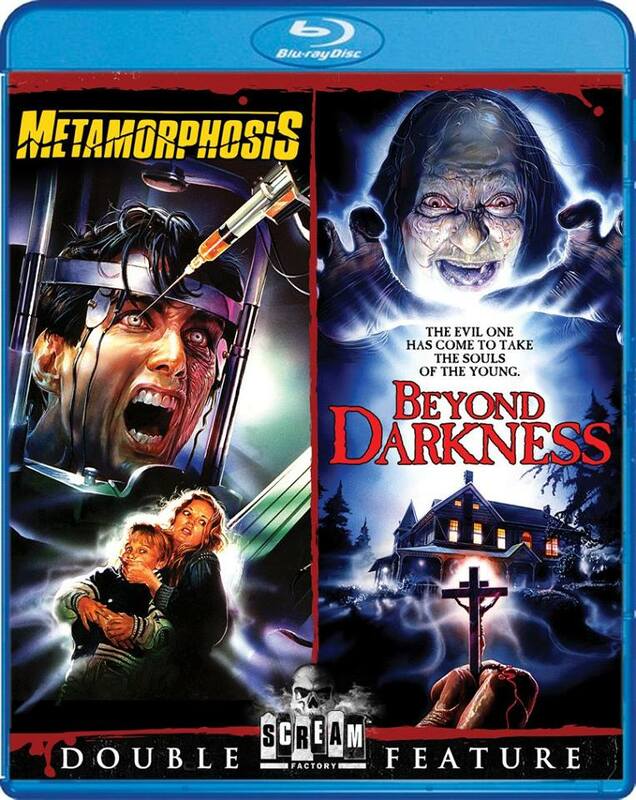 A double feature of insane Italian horror awaits you… On August 25, 2015, Scream Factory proudly presents Metamorphosis and Beyond Darkness, two tales of scary supernatural shenanigans both on Blu-ray for the first time! First up is the science-fiction/horror of Metamorphosis! When his experiments in genetics are mocked by his colleagues, maverick scientist Dr. Peter Houseman takes extreme measures to prove that his untested anti-aging serum works. Injecting himself with his miracle cure, he soon experiences a terrifying change within himself that threatens not only the lives of those around him, but also his own sanity. From cult cinema mainstay George Eastman, Metamorphosis proves that nightmares may change, but fear is forever! Next, take a terrifying trip into a world beyond fear, beyond belief… Beyond Darkness. When a man of God and his loving family move into a new house, they think they’ve found the perfect home…until they discover that their new digs were once the location where a coven of witches were burned at the stake! It’s only a matter of time before the radio starts blaring satanic chants and the cutlery takes on a mind of its own. Will the awakened evil in this house have its final revenge, or can a plucky priest fend off what lurks Beyond Darkness? This tale of terror comes from Claudio Fragasso, the director of Troll 2 (so you KNOW it’s good! ).